Some people who win significant amounts in the lottery quit playing. They figure that they have exhausted their share of luck and the odds are against them winning again. Winners like James Harrison just continue buying lottery entries. It has just been four months since Harrison, a retired catfish farmer, won a million dollars on the $200 Million Blowout game. 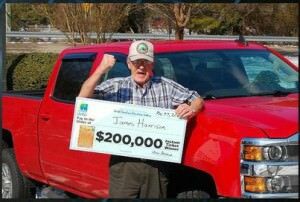 But because he kept playing, he has found himself in the winner’s circle again for $200,000 on a 20X The Cash ticket. This time he takes home $138,501 net of taxes. With his new riches, Harrison wants to add to his house and get the roof fixed.